Dr Simon Grennan is a scholar of visual narratology (www.simongrennan.com). 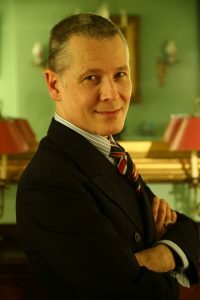 He is author of A Theory of Narrative Drawing (Palgrave Macmillan 2016), co-editor, with Laurence Grove, of Transforming Anthony Trollope: ‘Dispossession’, Victorianism and 19th century word and image (Leuven University Press 2015) and contributor to Representing multiculturalism in comics and graphic novels. (Routledge 2014) and others. He is the creator of Dispossession, a graphic adaptation of a novel by Anthony Trollope (Jonathan Cape and Les Impressions Nouvelles 2015) and, since 1990, half of international artists team Grennan & Sperandio, producer of over forty comics and books (www.kartoonkings.com). Dr Grennan is Research Fellow in Fine Art at the University of Chester and Principal Investigator for the two-year research project Marie Duval presents Ally Sloper: the female cartoonist and popular theatre in London 1869-85, funded by an AHRC Research Grant: Early Career (2014).